Touch for Health is a system of balancing posture, attitude, and life energy to relieve stress, aches and pains, feel and function better, be more effective, clarify and achieve your goals and enjoy your life! 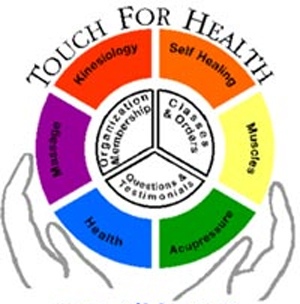 Touch for Health is a powerful healing method for activating and ‘switching on’ the human body. It is designed to release pain and stress naturally using simple muscle testing feedback techniques to identify the sources of stress which lead to chronic pains, illness, mental fogginess and other related facets of diseases. In a Touch for Health session, muscles become monitors of stress and imbalance within the body. The concept of “muscle testing” becomes a very effective and versatile tool for detecting and correcting various imbalances in the body which may relate to stress, nutrition, learning problems, and injuries. 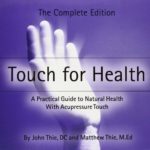 Touch for Health was created by John F. Thie, DC (1933-2005). The first Manual was published in 1973 and launched a worldwide movement in a holistic approach to health which teaches the restoring of our natural energies. It is a practical guide to natural health using acupressure meridian lines, touch and massage to improve postural balance and reduce physical and mental pain and tension. Is Japanese for ‘universal life energy, and is also a word used to describe a system of natural healing, This tradition was founded by Dr Mikao Usui in the early 20th century and evolved as a result of his research, experience and dedication.We live in a world of energy that nourishes and maintains all living things. When this energy flows uninterrupted there is balance and harmony within and around us, and we experience a sense of well being. Reiki treatment is a process that anyone can enjoy in the normal course of their life. Reiki can be used alongside other conventional or complementary treatment and often helps to provide emotional support during recovery.I will use Reiki in conjunction with Touch for Health as I believe that energy is energy and therefore can be worked on in different ways. The practitioner gently places their hands in a series of non-intrusive positions on or near the body. There is no massage or manipulation. The whole person is treated rather than specific areas and the client is fully clothed. Sessions can take 45 minutes to an hour, depending on the client’s needs. Clients may or may not feel sensations during a Reiki treatment. Benefits reported by recipients include deep relaxation promoting a calm, peaceful sense of well being on all levels. Some people feel sensations of heat, tingling, or experience seeing colors, whilst others can have an emotional response, indicating that shifts are taking place, allowing harmony to be restored. What are some of the healing benefits of Reiki? -Removes energy blockages, adjusts the energy flow of the endocrine system bringing the body into balance and harmony. -Raises the vibration frequency of the body. -Can help with acute (injuries) and chronic problems (asthma, eczema, headaches, etc.) and aides the breaking of addictions. – Assist the body in cleansing toxins.